Even though EFM Racing's principal, Eric Purcell has been working in racing and winning Championships since the late 1970's, EFM Racing itself really became it's own entity in 1993 running a highly successful Pro Sports 2000 Team for Team Lucas Racing, winning both the 1993 American Cities Racing League driver and team titles and the SCCA National Championships that year. Further success in Sports 2000 lead to EFM Racing being hired by the Carbir factory to refine their Sports 2000 car and run their factory race team. 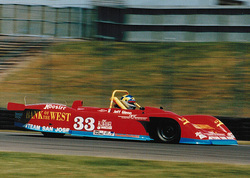 This lead to another ACRL title in 1996 for Jeff Glenn, and also to EFM's continued involvement with Carbir to design a new challenger for the open-wheel USF2000 series. This highly successful F2000 design lead to race victories and a close championship battle for driver Andy Lally prior to him moving up the ladder to Formula Atlantic and later into Sports Car racing where he still makes a living these days. EFM racing continued to have success in both open wheel and sports cars throughout the next decade, and Purcell Race Engineering was added as a subsidiary of EFM to provide race engineering consulting to a variety of professional teams. These teams included Walker Racing (Formula BMW and Formula Atlantic), AIM Autosport (Pro Mazda and Daytona Prototype) and Team GDT (Pro Mazda). In 2008, John Edwards won the Pro Mazda Championship title with Purcell Race Engineering providing their services to AIM Autosport. Purcell Race Engineering continued to consult in the Pro Mazda Series for the next several years with AIM Autosport. The next several seasons saw the team working mostly with drivers making the move straight out of Karting and into the Pro Mazda Championship. It was out of this experience that the curriculum for EFM Racing's K2C program was born. Currently EFM Racing is largely supporting it's K2C Karting drivers in the west-coast based Formula Car Challenge series, and Purcell Race Engineering continues to consult to a variety of professional race teams in Series such as Pro Mazda, USF2000 and the Tudor Sports Car Championship.